We're celebrating 10 years in business this year! 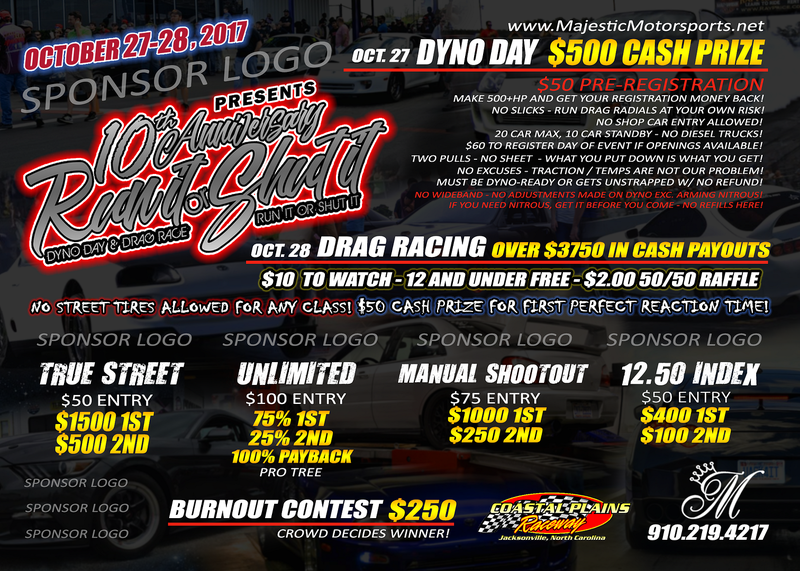 To celebrate we're holding a TWO-DAY dyno day & drag race event October 27-28, 2017! We've got over $3750 in cash payouts! This event is going to be big! Don't miss it! Last edited by Wes@Majestic; 07-27-2017 at 12:15 PM..
Flyer is a proof, glad you caught that. We are not allowing anything other than SLICK or RADIALS. You can run either in that class. RUN YOUR CAR , NOT YOUR MOUTH ! ! !